According to The Popcorn Board, Americans consume more than 16 billion quarts of popped popcorn each year. This equals about 242 cups of popcorn per person. Popcorn is a whole-grain source of high-quality carbohydrates such as fiber. 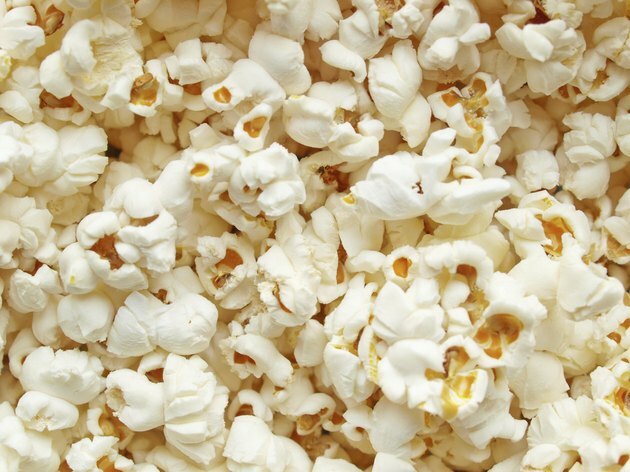 Between meals, popcorn can be a low-fat snack that fills you up without weighing you down. Combined with a healthy diet, popcorn can help meet your daily potassium needs. There are 26 mg of potassium in a cup of air-popped popcorn. Unpopped popcorn kernels contain more than three times as much potassium, at 78 mg per cup. Both microwaved and oil-popped popcorn provide approximately 64 to 68 mg potassium per cup. A cup of unpopped popcorn kernels provides 106 calories, 3 g protein, 1.2 g fat, 20.7 g carbohydrates and 3.6 g fiber. Air-popping the kernels slightly alters their nutrition content, providing 110 calories, 3.6 g protein, 1.29 g fat, 22 g carbohydrate and 4.1 g fiber. Popping the kernels in oil further alters their nutrition content to 142 calories, 2.5 g protein, 7.9 g fat, 16 g carbohydrate and 2.8 g fiber. Potassium is an electrolyte and mineral that is needed for proper heart function, muscle contractions and normal digestion. It is important to keep a healthy balance of potassium in the body. High levels can cause irregular heart beat, nausea and low pulse. Low potassium levels can cause abnormal heart beat, muscle breakdown, constipation, weakness and paralysis. It is recommended that adults consume 2,000 mg of potassium each day. One cup of popcorn meets 1 to 4 percent of your daily potassium needs, depending on how it is prepared. The easiest way to meet daily potassium needs is to follow a balanced diet rich in fruits, vegetables, lean meats and whole grains. Foods rich in potassium include bananas, citrus fruits, cantaloupes, avocados, tomatoes, potatoes, lima beans, salmon, cod and chicken. Is Popcorn a Good Source of Fiber?